March is Poison Prevention Awareness Month and it is important you keep your pets safe. “Pets are curious and often can’t resist smelling, tasting and sometimes swallowing foods, plants and other items in our homes that interest them,” said Ahna Brutlag, DVM, MS, and assistant director at Pet Poison Helpline. Taking simple steps to poison -proofing your home room-by room can help protect your pet. Some common household plants can be toxic to dogs and cats. Do your research and avoid toxic plants in your home. Keep purses and backpacks in a safe place. They often contain potential pet poisons such medications, cigarettes or sugar-free gum with xylitol. Many common food items in our kitchen are poisonous to our pets and you should take care to make sure your pet cannot gain access. 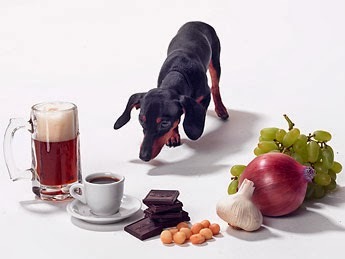 The most common include: Chocolate (chocolate is the number one reason owners call the pet poison hotline) , Xylitol (sugar-free chewing gum), Grapes/raisins/currants, Caffeine (coffee, tea), Fatty scraps, Onions/garlic/chives, Macadamia nuts, Alcohol. Remember to secure your trash too, often this is the source of pet poisoning (or gastrointestinal upset). Keep medications such as over-the-counter and prescription pills, inhalers and dietary supplements, safely locked up in secure cupboards, not on counter tops or in plastic bags can easily be chewed through. Yard insecticides and fertilizers can be very dangerous if ingested in large amounts. Keep them in pet proof containers and use caution when using them in your yard. If you think your pet may have ingested something harmful, take action immediately. Contact your veterinarian or call the ASPCA Pet Poison Hotline: 1-888-426-4435.